7 Steps to Finding Purpose, Passion and Freedom. 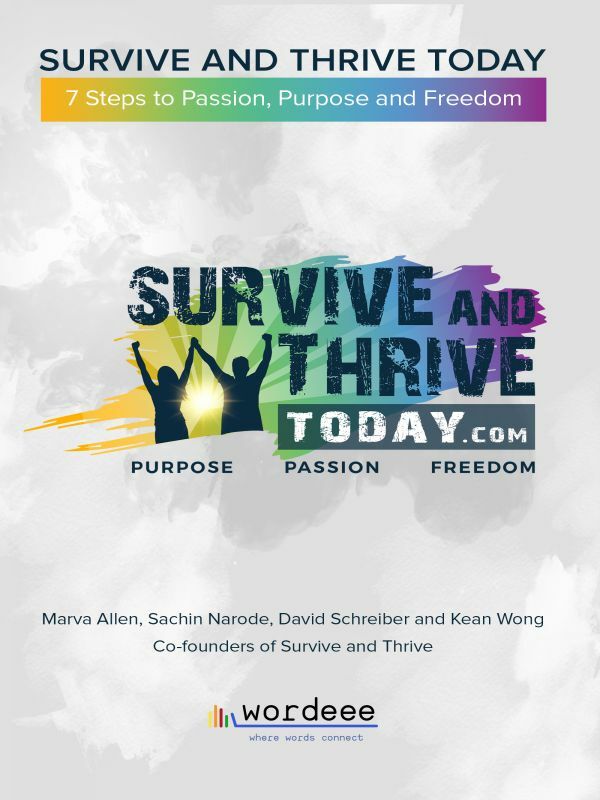 The Founders of Survive and Thrive Bootcamp for Mission-Driven Entrepreneurs pen a practical guide for 21st century entrepreneurs. The Founders of Survive and Thrive Bootcamp share their experiences and stories around entrepreneurship and global conferences. Their goal in creating the Survive and Thrive Bootcamp was to return meaningful engagements at tech conferences for start-up and lifestyle entrepreneurs. They were determined to find an antidote for mega tech conferences where little value is available for these hard working entrepreneurs. The T.H.R.I.V.E. Manifesto and core values represent what we believe are the 7 Steps to Purpose, Passion and Freedom. All businesses, regardless of its type, should be governed by a corporate culture (values) and driven by its goals and objectives. The values of a company should permeate and epitomize its brand. If a brand strays too far away from your values, it will clearly show up in the company’s performance and bottom line. Most significant it can alienate the very people who bought into your company’s philosophy in the first place. Take Apple Computer (now Apple Inc.), for instance. Apple, without a shadow of a doubt knew what it wanted to be: a design company that delivered great productivity through the computer. They were adamant about their distribution model and frenetic about their customer base. Their strategy was long term and they almost failed twice. Every time they faltered, it was because outsiders tried to change their values and vision. Yet, their stalwart internal and external customer refused to let them die. Ingenuity, caring and loyalty were a big part of the Apple culture. They remain so today even as they hold the trophy as the biggest company in the world. For our events our goal is to deliver quantifiable value to our audience and never to get too big so meaningful interaction can never happen. Our Mission at Survive and Thrive is simply to help Mission-Driven Entrepreneurs get the Knowledge, Resources and Partnerships to go from Surviving to Thriving. Whenever the temptation to stray from our mission arises we will, I assure you, harken back to why we started Survive and Thrive in the first place. Providing access to partners, investors, information and mentorship in a purposeful and intimate way is our ultimate goal. T: Tenacity, Timing & Trailers - Thomas Edison said, “Genius is 1% inspiration and 99% perspiration.” There has never been a truer statement. I know everyone wants ‘it’ now and maybe even yesterday, but the honest truth is that ‘it’ takes time to build a house upon a solid rock. The magic formula is hard work and consistent performance. If you are building a company for the long haul, there are no short cuts. Timing is also another important factor. Don't forget the importance of riding the wave of timing and megatrends. Collective focus on the particular comes when the general audience is aware of the megatrends. So jump in and take advantage of the perfect storm for launching your project. Be prepared to carry your baton to the finish line by representing your product well and being the star of your awesome brand! Yes, take a page out of Richard Branson’s book and be the face people can trust and respect. H: Humility & Humor - There can never be a day so long that an entrepreneur win or lose, can’t find a way. (Dionne Warwick fan here). Often, after a too long and arduous day, one has to step away from the mountain to try and find the humor and humility in the process. In business, there is no place for oversized ego. The situation must be determined by the choices and results. If you can’t do something, there is no shame in saying so. Your team will rally if you are building the right culture. If you can do it well, then do so and instill confidence that you can walk and talk at the same time. Take Bill Gates, for example. He is a brilliant technologist and thinker. He knew this and was humble enough to say I don’t know the other skills required so I need help. He needed his co-founder Paul Allen, another brilliant businessman with the skills to operationalize his vision. Paul Allen was as powerful a thinker as Bill Gates in the world of operations. He knew what to do to turn vision into success. Another example is Travis Kalanick of Uber and co-founder Garrett Camp. Brilliant technologists who ignored some of the warning signs along the way. Employees, their front line people, were telling them there was an operational problem but outsized ego neglected to listen or stabilized the core values of their company in preference to the barrels of money pouring in. Operationally, all companies have growing pains. When the focus is on pure growth, the need to build systems to manage that growth is neglected and core values and corporate culture erode, reflect hostility and therein lies the perfect recipe for disaster. The pair needed their Paul Allen who understood that speed of growth is directly proportionate to the ability to scale. Can they still find humor and humility at Uber? Sure they can. Humor can make painful situations tolerable and humility can go a long way when you’re in it together. Your partner can become your mentor and biggest ally or they can become your biggest liability. Having fun on this journey we call Life and Entrepreneurship is a key factor in seeing the forest from the trees.